Mercedes say they will have to consider dropping Lewis Hamilton or Nico Rosberg if the pair cannot race together cleanly. 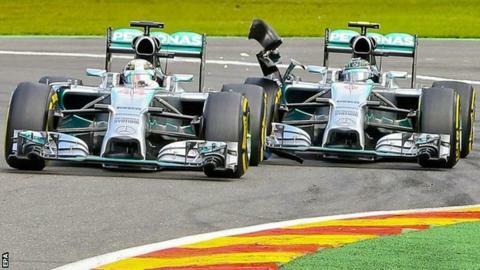 The ultimatum from Mercedes sports boss Toto Wolff comes in the aftermath of the drivers' collision in Belgium. The team have made it clear before this weekend's Italian Grand Prix that there must be no more on-track contact. "We would have to take decisions and take the consequences of having a different line-up," said Wolff. "If we are not able to manage the two of them following the Mercedes-Benz spirit then we need to admit that," added Wolff. Mercedes have taken disciplinary action against Rosberg for the collision at Spa on 24 August, for which the German has taken responsibility and apologised. The collision caused a puncture in Hamilton's car and forced him to retire, and Rosberg subsequently opened up a 29-point advantage over his team-mate in the championship. Wolff, speaking in an exclusive interview with BBC Radio 5 live, refused to give details of the internal action taken against Rosberg. Wolff said: "When you are managing a team it is very important to keep it balanced. I would very much like the penalties we have been implementing to stay within the team because it is just not fair on the driver to discuss that in public. "We have made it very clear this is an unacceptable scenario for us, for both of them. We don't want this to happen ever again." Meanwhile, Hamilton has queried the FIA's decision not to investigate the collision with Rosberg. The governing body decided not to look at the incident again despite it emerging after the race that Rosberg had told his team he had known the two could crash. Hamilton said: "Can we race a lot closer and if the other guy is out of the race nothing will happen? Or if it happens again will there be a penalty? "We are always asking to be able to race. But there is a fine line." FIA stewards looked at the clash while the race was in progress and decided it was a 'racing incident' that required no further action. The governing body has said there was no reason to revise that view. The German, of whom team bosses were highly critical, said: "I was not proud of the way it went in Spa, because in general I really want to contribute to my 'sport'. I want it to be the most entertaining sport in the world and if I am able to contribute I am very happy about that and I'm sure we have." He described his relationship with Hamilton, and between the two sides of the Mercedes garage, as "a healthy rivalry". Hamilton, asked whether he could trust Rosberg for the rest of the season, said: "Trust is a big word and it is not something I would apply to a race on the track. Nico and I have been racing for a long time, we set a good foundation a long time ago and that's what we work from." Hamilton said the decision had made no difference to his desire to stay with Mercedes beyond his current contract, which ends in 2015. "I am constantly talking to the team and the priority is to win the championship," he said. "I have a contract for another year so there is no rush, but I would like to say I see my future with Mercedes."